Last spring I was given an Actionbent recumbent with some parts (like a rear wheel) missing. 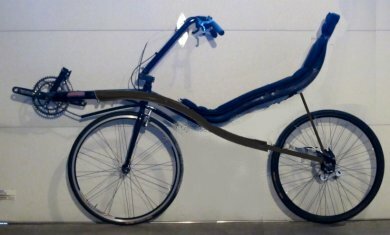 I thought this might be a good bike for my brother. 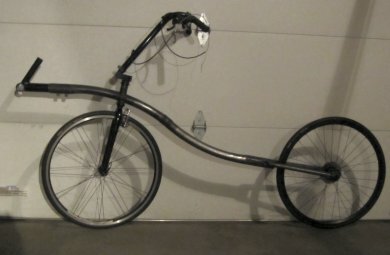 It has 26 inch wheels and I don't have any wheels of that size on any of my other bikes. 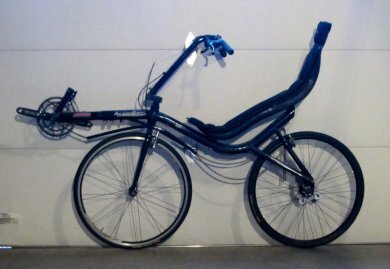 I finally got the rear wheel built and installed on the bike and saw what the bike really looked like. A 36 inch wheelbase highracer is too short. You can see that the head would be behind the rear axle, making handling squirrely. The seat is too small. It would be fine for somebody under 6 feet but I am on the plus side of that by 6 inches or so. The seat is not adjustable at all. Other than that it is perfect. I don't think it would work for my brother in its present form, so either I sell it as is or I strip all the parts off of the frame and build a new one. I already have a bent 2" cromoly tube. This is the tube that I spent many weeks rolling though with the Harbor Freight tubing roller a few years ago. Here's what it would look like with a 48" wheelbase, the bent tube frame (tube gets cut in the middle and rejoined) and with the seat extended about 4". 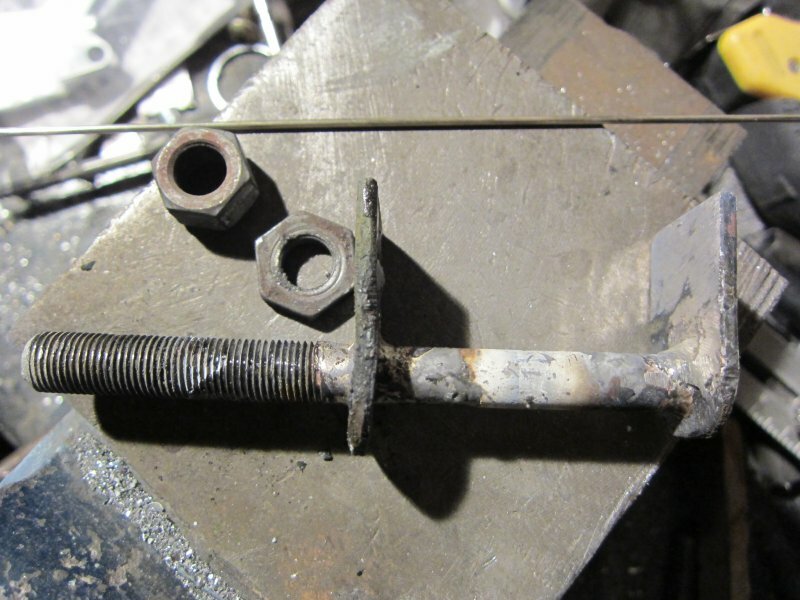 I took apart the Actionbent, cut the chrome moly bent tube and rebrazed it so it looks like the drawing. I also made a 1X drawing to help get the head tube angles and frame geometry right. The action bent used a fancy headset that fit completely inside the head tube, so I can't reuse that, but most of the rest of the parts will be reused. Seat height will be about 21 inches for me, and higher for people with shorter legs. 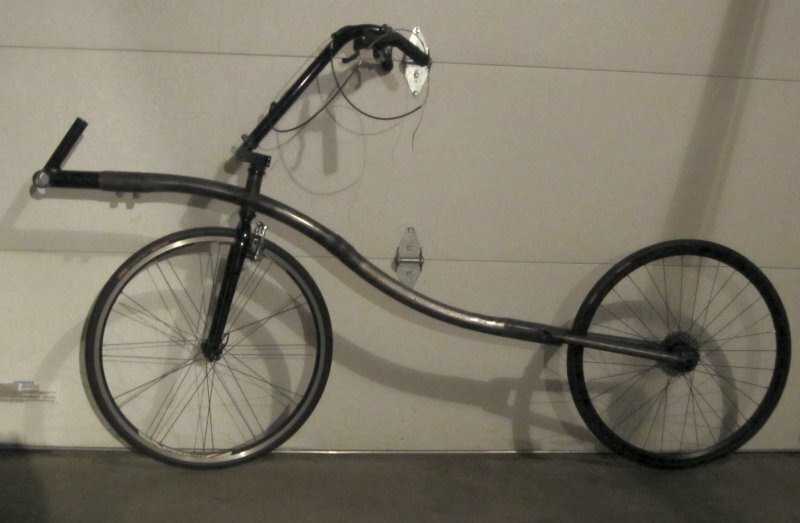 With a 48" wheelbase the bike will be plenty long. Here's the frame mounted in the frame jig with the headtube hole cut through the frame. You can see the patch where the two sections of frame were rejoined on the right. The boom tube fits well into the frame tube after the addition of a sheet aluminum shim. I also added the pinch nuts to securely hold the boom tube and allow a little adjustment. Probably the boom tube with be shortened after the seat placement is decided. I ordered some 1" x .049" tubes from Wicks Aircraft to be used as the rear wheel stay tubing. The tubing arrived and after a very cold week it finally warmed up enough for me to venture out into the garage to do some cutting, filing, and grinding. Here are the rear stays jigged into place and ready to be tack brazed. I am using a set of Breezer rear dropouts from my parts bin. An inexpensive threadless headset was ordered from Niagara Cycles. I tack brazed the rear stays and dropouts on and then added the wheels to check the alignment. Hmm. Checking by sight from the rear shows that it needs a tweak. 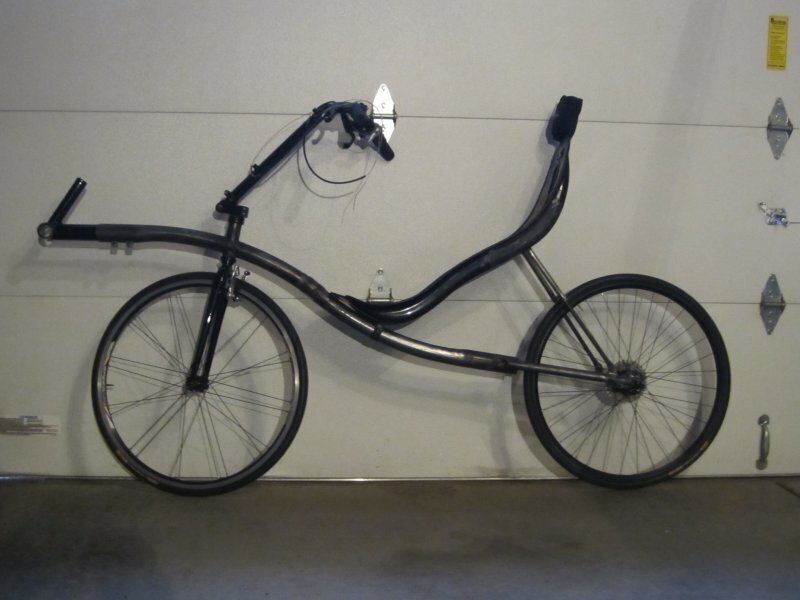 The rear stay and and head tube brazing was completed. Installed the headset, fork and handlebars and cut 5 inches off of the boom. I am now working on the seat brackets. Also it looks like the handlebars will need to be at least shortened, if not modified as they are way too high and upright. Here's the front seat bracket. On top of the tube clamp is a concentric tube to allow the seat to pivot. I had already made parts of this clamp for a previous project that it didn't get used for, so it was nice to be able to use it. The rear seat stays are next. Finished the rear seat stays They are adjustable and use a tubing clamp to lock them in place. 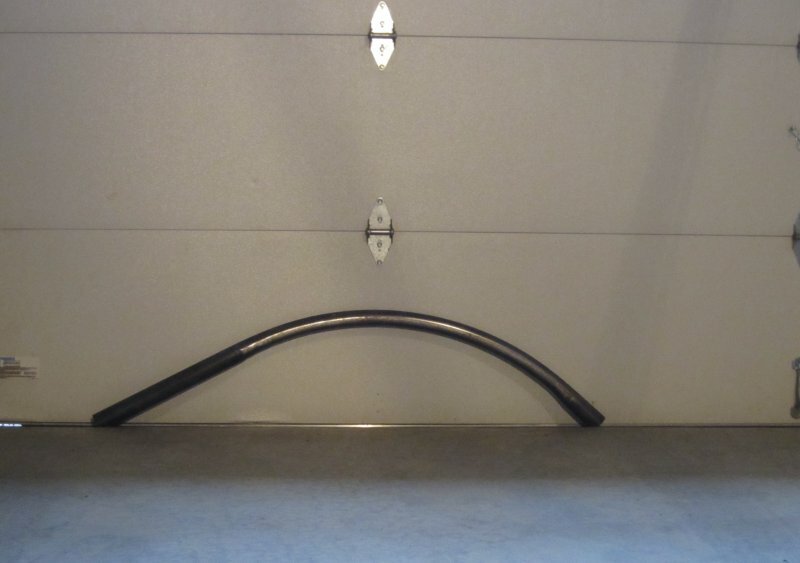 The inner tube is made from thinwall 1/2" chromoly and the outer tube is 5/8" x .053" wall. Not super light but plenty strong. The ends are just smashed and then ground to round them off. I brazed seat mount tabs onto the wheel stays. They are 3" forward from the dropouts to take some of the road buzz out. 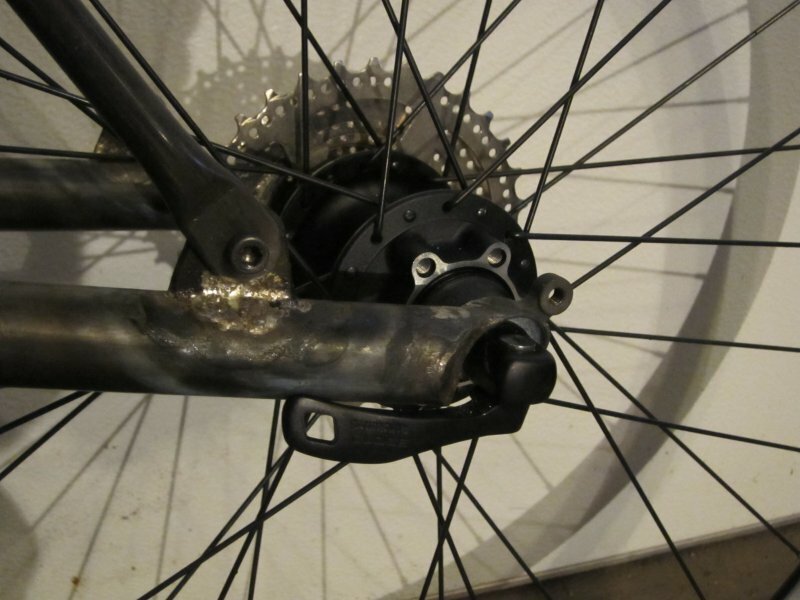 This is a problem with bikes that have the seat stays mounted directly to the rear dropouts. 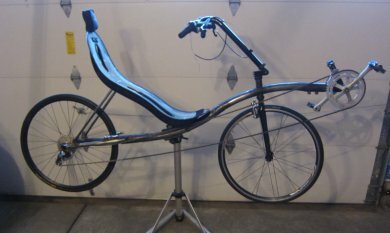 I am thinking about brazing in another set about a foot further forward to allow the seat to be adjusted for kids to ride the bike. 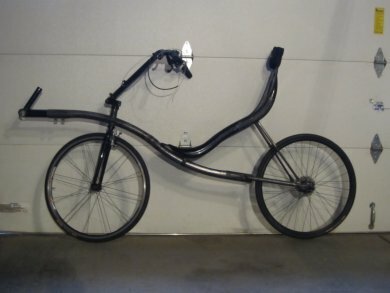 Here's how the bike looks with the seat in the extra tall guy position. 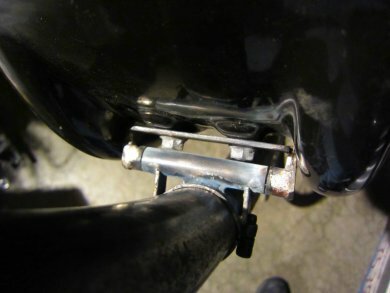 The tubing clamp on the seat base will allow the seat to be adjusted for a wide range of riders. The adjustable rear stays will allow an upright or laid back riding position. Its in the most upright position now. I added some Shimano 105 cranks that had been gathering dust and located a set of braze-on canti brake studs that I had cut off of an MTB fork. Looks like they will work well to mount the rear brakes after the usual filing and brazing. Brazed on the rear brake canti-brake studs and mounted the brake arms. I found a couple 1ft chunks of 9spd chain to lengthen the chain from the ActionBent so it's long enough for the stretched wheelbase and added the chain. Next step is chain management. 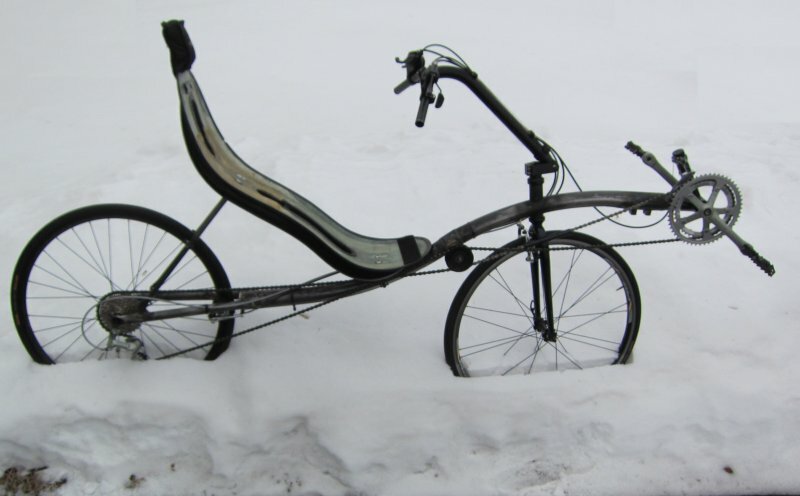 The bike will need a power side idler and a return chain idler. Also I will add and some chain tubes to prevent the chain from rubbing too much on the fork. After that, the bike will be ready for its virgin test ride. Discovered the chainline works better on top of the chainstay, so I will need to move the rear brake canti-studs to the bottom of the chainstay tube. 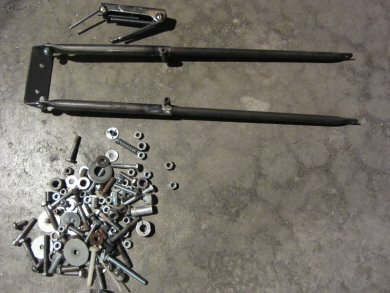 I built the idler bracket and brazed it up, mounted the idlers and shortened the handlebar riser a couple inches. 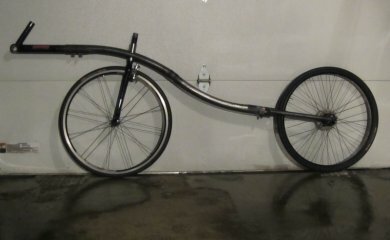 I took it for a quick test ride in the dark with the Flintstone brakes. Low speed handling is good. Even after narrowing the front brake the power side chain will rub easily so I will need to add a short chain tube there. Here's what the idlers look like, and the chainline around the front fork. The brakes aren't connected yet so they are sprung wider than they would normally be, but you can see it will be tight and require a chain tube. If the power side chain still deflects after connecting the brake cable I may need to change to a narrower caliper front brake. 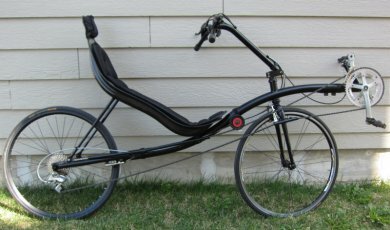 The Actionbent had no front shifter lever, and I didn't have anything appropriate that was not part of a set, so I replaced the brakes and shifters with an integrated set of Shimano shifters / brake handles I had purchased for a previous project and had not used. 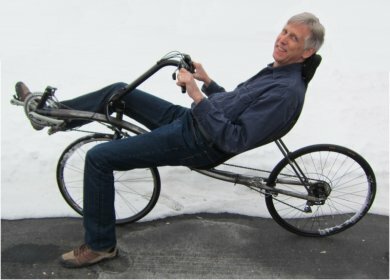 Will they work with the older SRAM shifter? Weekends have been busy or it has been too cold to go out in the garage but I have had some time to do some tweaking. Of course the SRAM rear derailleur did not work with the Shimano shifter so I had to steal a short cage shifter off of another bike. It shifts better but in the small chainring- small cog combination the derailleur is completely folded. I may still be able to remove a couple more links of chain to fix that. The brakes and front shifter all and set up and working properly. I may add another chain tube under the seat as the chain rubs a bit there when set in the extra tall position for me. The seat is completely adjustable so it should be able to slide all the way up to the handlebars if needed. My wife snapped a shot of me on the bike. That's a nice little bike if I do say so myself. it will be hard to give up! After paint and tweaking it's ready for a test ride. 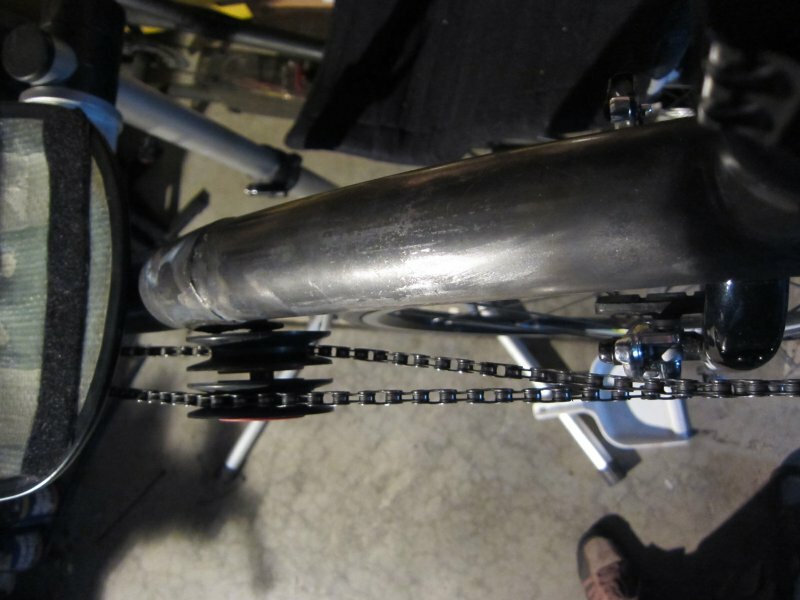 I decided to use an idler on the power side chain and let the return chain float. There is a long chain tube to guide the power side chain under the seat and prevent it from slapping the top of the chain stay tube, and a short section to guide the return chain around the front fork.